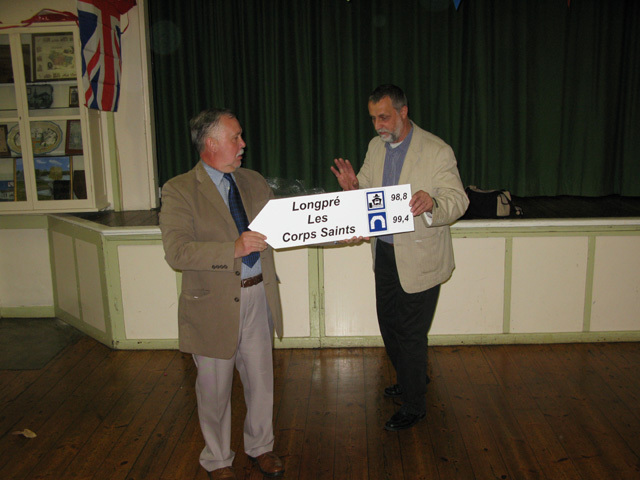 The weekend of the visit from Longpré finally arrived, the date had been set last year and much of the intervening time had been spend trying to organise fitting events for our guests to celebrate this, the 30th anniversary of the original signing of the Twinning declaration. A full program had been planned and the funds raised to finance the events, it was now time to see if our efforts were repaid, measured by the success and smooth running of the weekend. 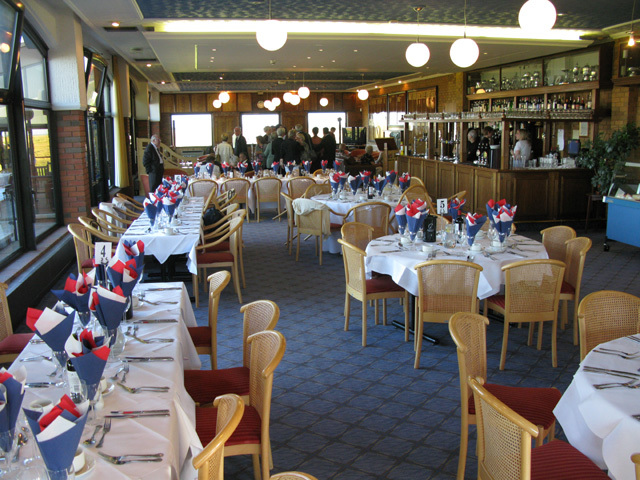 Friday the 20th May 2011 saw the arrival of 41 guests from Longpré and the coach driver who brought them, a number not seen for some considerable time, a testament to the efforts made by members of the committees on both sides of the channel to encourage new members to join. 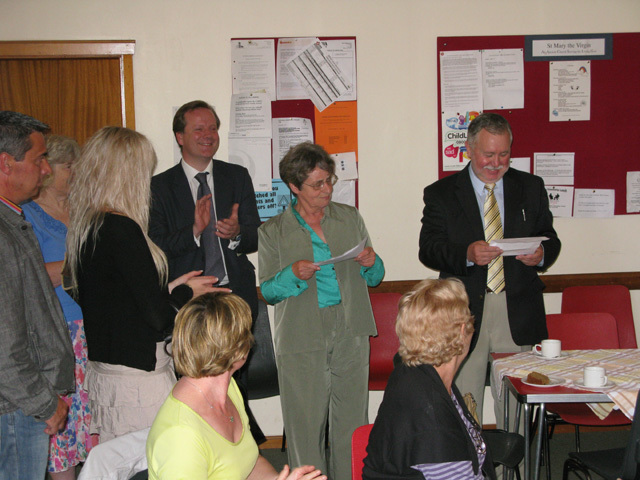 The reception was held at Eastry village hall and the chairmen of the two associations exchanged gifts. 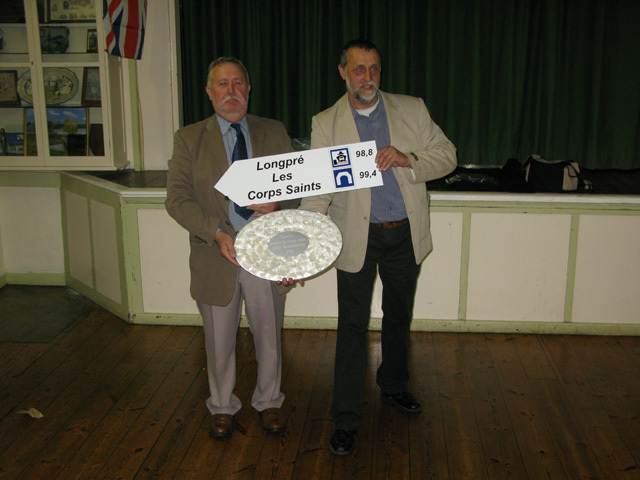 From Eastry, an engraved silver and mother of pearl salver (mother of pearl being the gemstone to commemorate 30 years) was presented by Terry James and in return he received from Jean-Marc Vermoeren a well wrapped package which when opened revealed a specially made road sign showing the distance from Eastry to Longpré (two distances actually, one via the Eurotunnel and the other by ferry crossing!). At a little after midnight the weary travellers were taken by their hosts for a much needed sleep - there was an early start on Saturday morning. 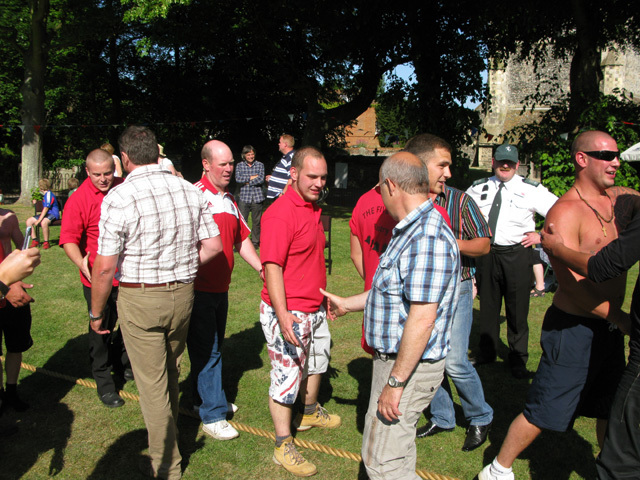 The day was beautiful, clear blue skies and hot sunshine - the one thing we could not influence but perfect for the events planned. 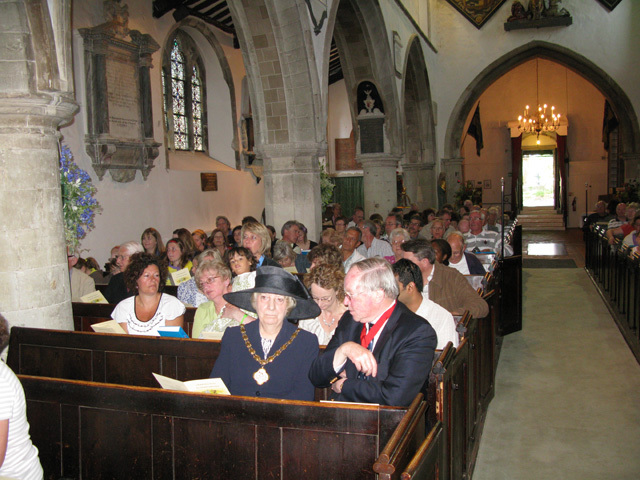 At 09:15 everyone gathered in the church for a re-dedication ceremony, mirroring that which took place 30 years earlier, and we were fortunate enough to have people there from that original ceremony together with local dignitaries and honoured guests. Unfortunately, owing to a last minute unexpected return to France, the Consul Général du France, M. Edouard Braine was unable to attend the ceremony but has agreed to sign the re-dedication certificate at a later date. 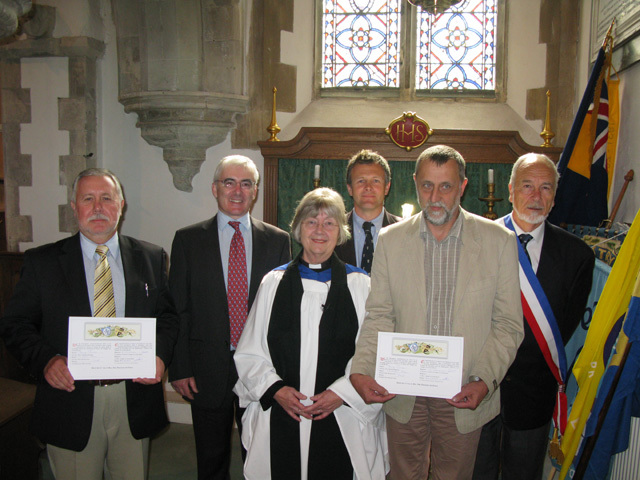 Five others were there to sign or witness the certificate, Terry James, Chairman of Eastry Twinning, Nick Kenton, Chairman, Eastry Parish Council and witnessed by Lord David Freud, Baron of Eastry and on behalf of the French association, President L'Amicale de Longpré les Corps Saints, Jean-Marc Vermoeren, and the Mayor of Longpré René Cailleux. The ceremony which included the signing of the declaration also included a short film of the original service taken 30 years earlier, a copy of which had been located in the Dover film archive. 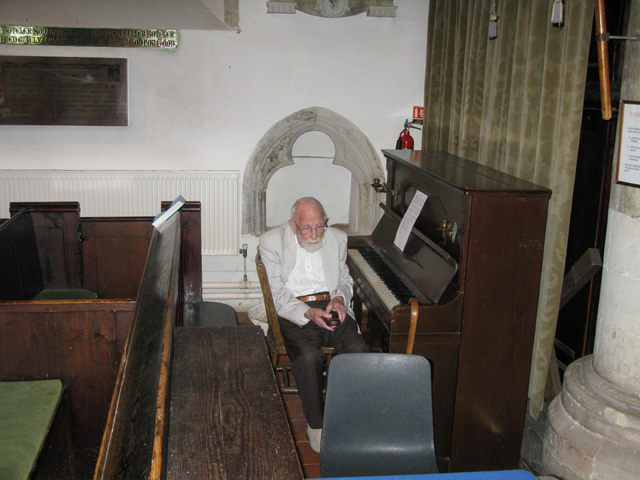 Children from Eastry school choir sang the first verses of both the National Anthem and the Marseillaise accompanied on the piano by the ever sprightly centenarian Martin Holloway. 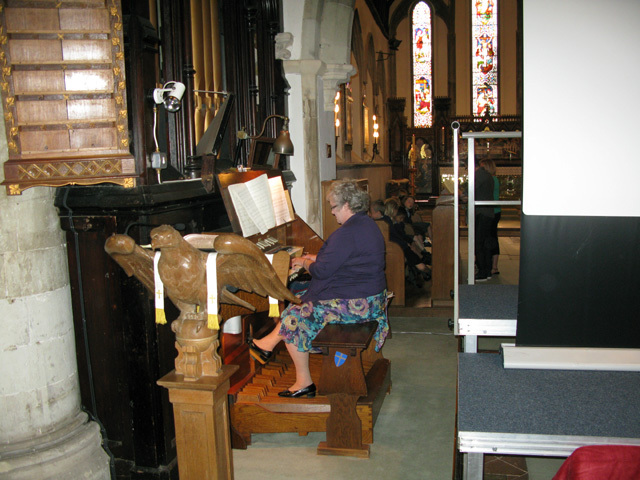 Maureen Norman, the organist at St Mary's church played various pieces which added greatly to the ambience, and we also owe Rev'd Jennifer Pilcher a huge thank you for conducting the service and allowing us to erect the staging etc for the event. 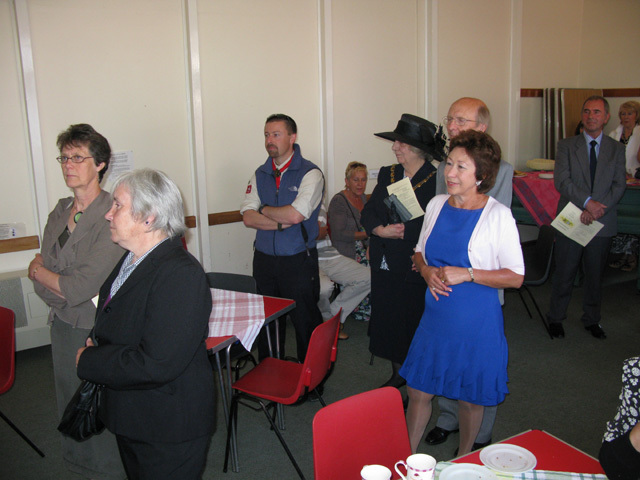 From the church, we made our way to the church hall where a busy team of ladies Liz, Rosemary and Terri prepared tea, coffee and delicious home made cakes for everyone (and then washed everything up afterwards) -another big thank you! 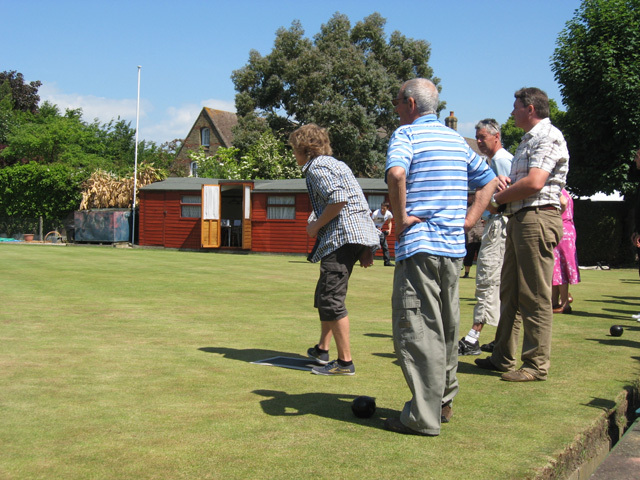 Next on the agenda, a chance to play bowls on the bowling green, what could be more British - tea and cakes and then a spot of bowling. 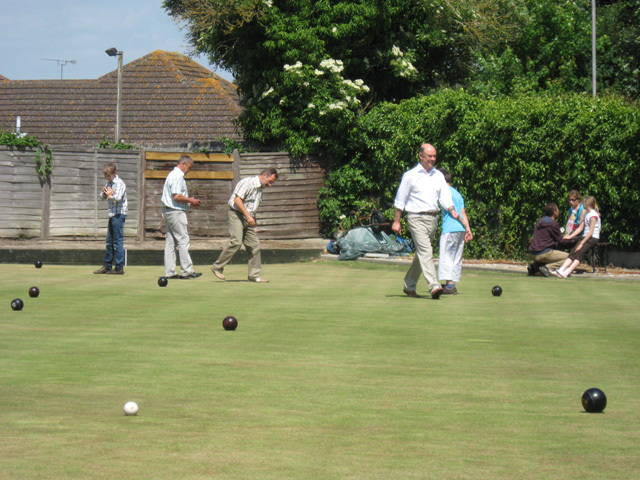 The green looked fantastic and was a surprise to many of our visitors, even those who'd been to Eastry before, many hadn't realised it was there. 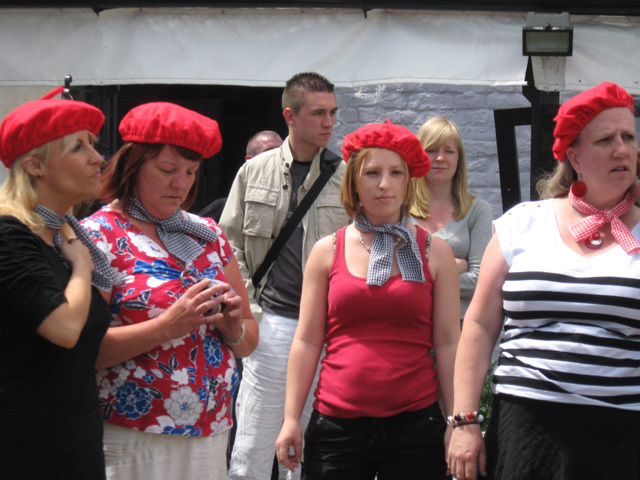 The French took to it well (rather too well for first timers I thought!) and really enjoyed the experience, even those just watching enjoyed the chance to sit in the sun and soak up the atmosphere. 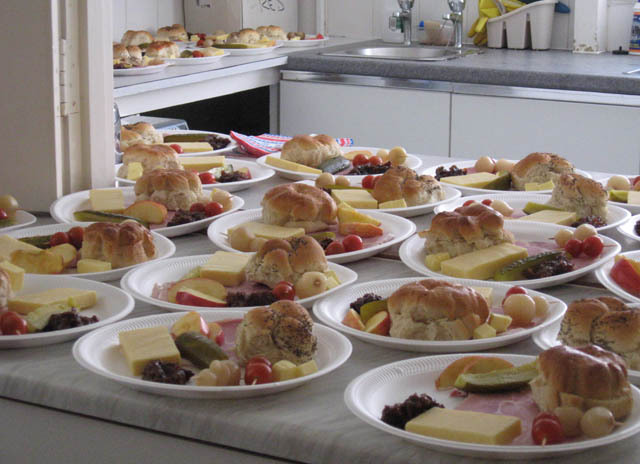 Whilst all this was going on, members of Eastry Twinning were busy in the church hall preparing a ploughman's lunch for about 80+ people under the guidance of Christine, our very efficient 'chef de cuisine'. 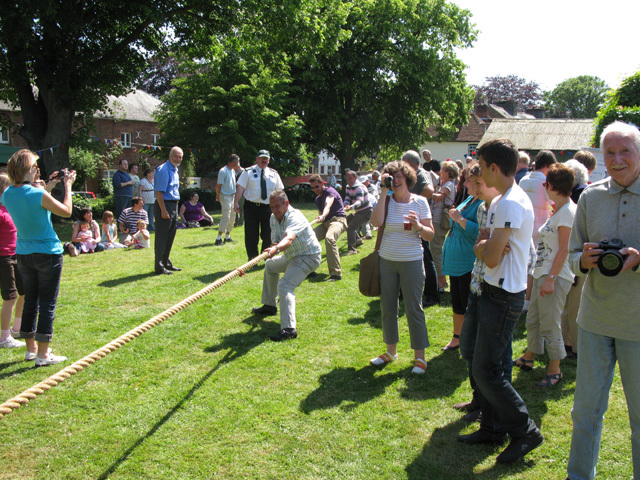 After lunch, the food stalls and entertainment and annual tug-of-war began on the village green. 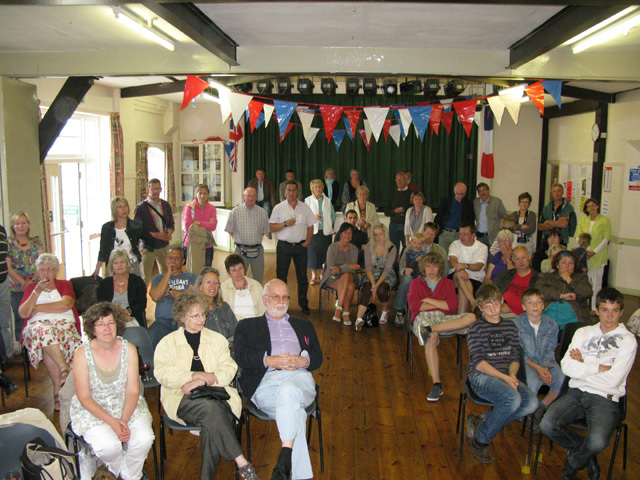 This event had thoughtfully been arranged to coincide with the visit from Longpré and offered another view of Eastry life. 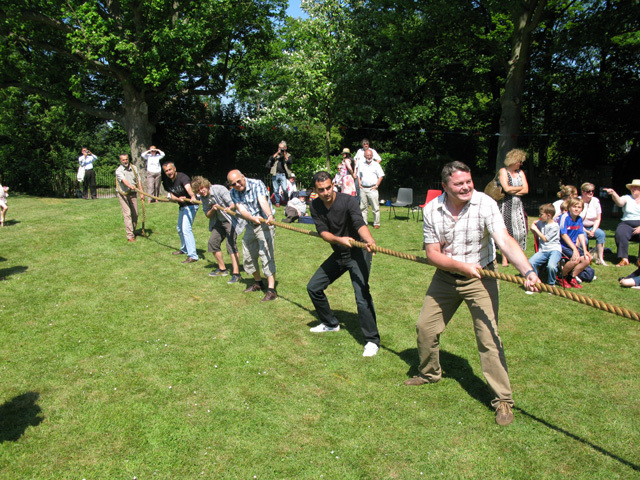 The French put two teams into the tug-of-war, like the bowls they gave a good account of themselves, one of the teams coming second. After all that exertion it was nice to have a rest and watch the Morris dancers and listen to the musicians play before heading home to prepare for the evening. 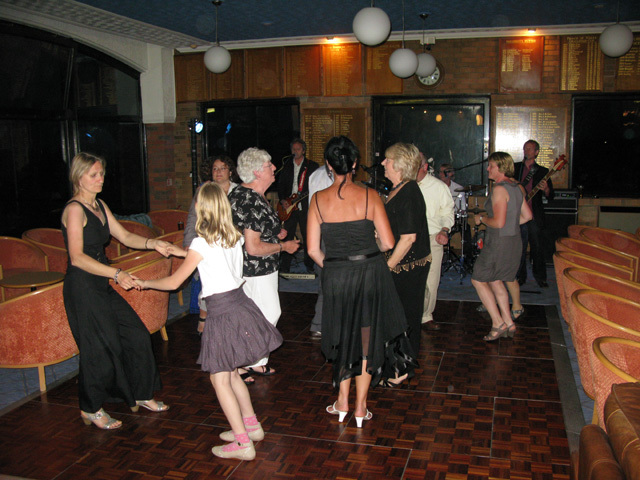 Taking advantage of the offer to use the large coach which had brought over the French visitors, we managed to get everyone on it that required transport and set off for Prince's Golf Club, our venue for the evening dinner and dance. 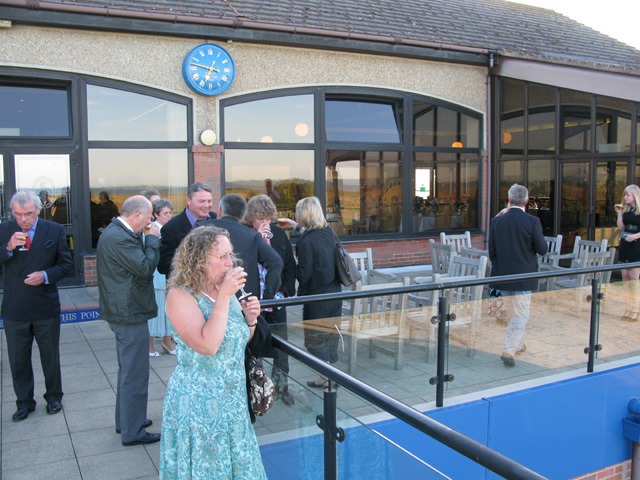 A superb setting in the evening sun, a glass of Pimm's on the balcony and then an excellent three course dinner was enjoyed by everyone. This was followed by dancing until nearly midnight by those that had the energy (just about everyone I think - especially Alain Defebvin who didn't appear to miss a single song). 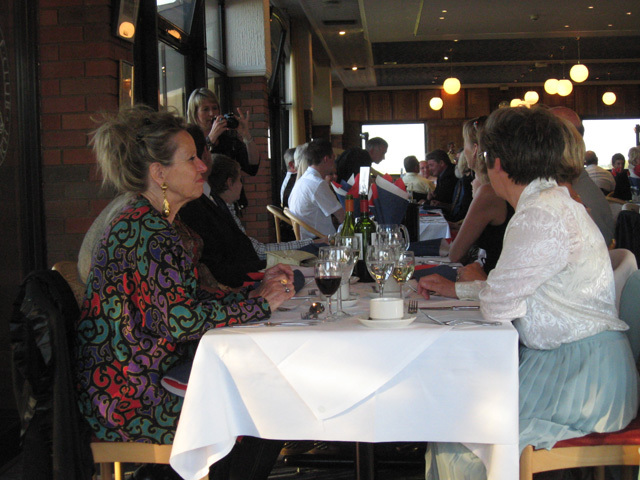 The musicians were excellent, the food was excellent as was the setting, the whole day had gone according to plan and we were happy that our guests were having a good time. 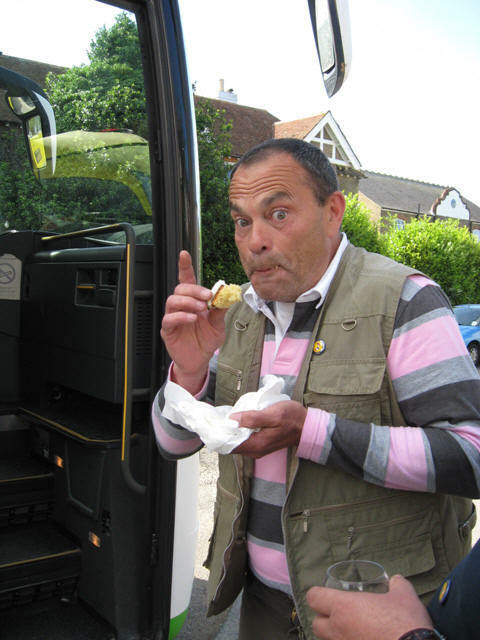 Those on the coach home were 'entertained' further with songs from both Graham and then Thierry, and despite Graham's occasional confusion over à gauche and à droite, Pascal the driver got us all home safely. Sunday 22nd May. 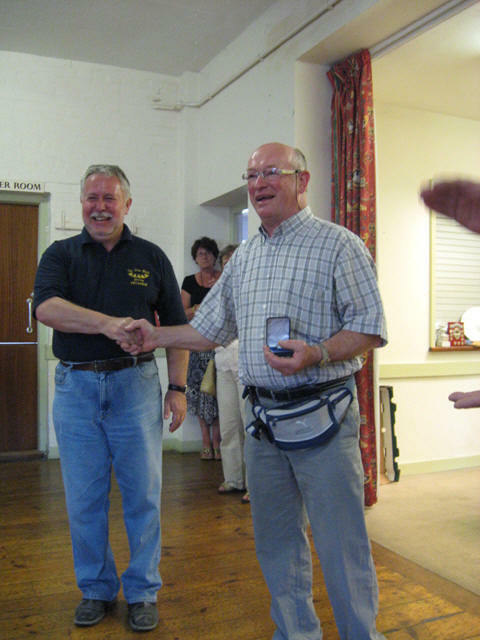 For many, this was 'free' time and the hosts arranged various visits with their guests, for others it was the annual petanque challenge for the coveted prize of The Ashes, not in English hands since 2003. Quite a few gathered to see the competition and it was one of the best and closest fought I can remember. A match consists of two games of triples and 3 games of doubles - with the triples games finishing one a piece we went into the doubles games with everything still to play for. The score boards showed Eastry in front in all three games for a while but that soon changed and it was very close throughout. Under Thierry Ducoin's relentless and alarmingly accurate 'bombing' (knocking our boule out of the way with a hard and pinpoint accurate throw over 6+ metres) Thierry and Jacques Daussy won the game against myself and Trevor Foster. 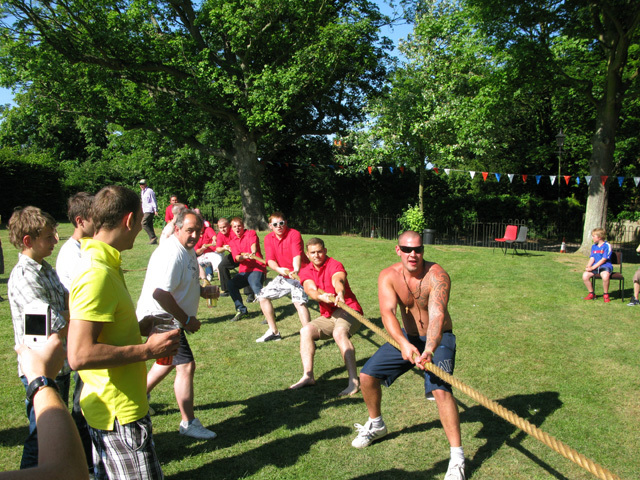 However, on the middle piste Robert Green and Dennis Sivil rallied and beat Patrice Alderweireld and Alain Defebvin leaving the match in the balance. All eyes were on Graham Lane and Terry James who had been pretty evenly matched throughout the bulk of the game against Arnaud and Maxime Devauchelle but had pulled ahead and were within two points of winning their game, with Terry's ball nearest the cochonet and only Graham left to play. His first throw failed to beat the opposition's nearest boule (the boule second closest to the cochonet) but with his second shot and a change of tactics he managed a Thierry type throw and knocked the opposition ball out of the way whilst leaving his own boule in its place - a shot known as a carreau, thus giving them two boules closest to the cochonet which is 2 points and therefore the game and for the first time in eight years the match 3 games to 2. The Ashes were back in England for one year at least! The captains exchanged gifts and the Ashes were returned to their ancestral home, safely locked up in our new display cabinet. The players and associated families retired to The Old Fire Station for a traditional English lunch of curry and rice and plenty of banter about how the game had been won or lost! 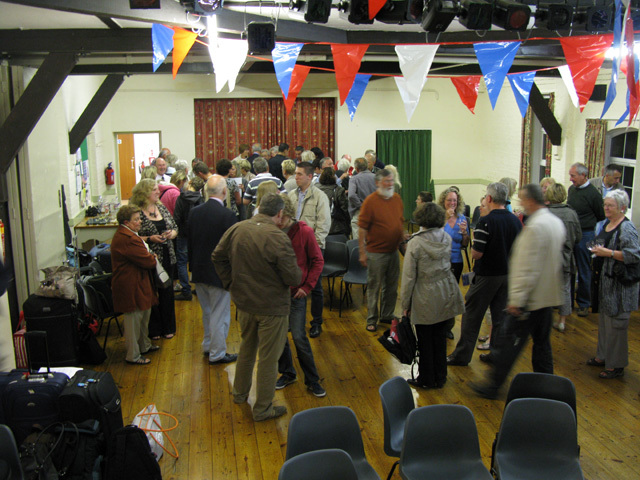 The last event of the day was a farewell gathering at the village hall with a couple of final surprises. 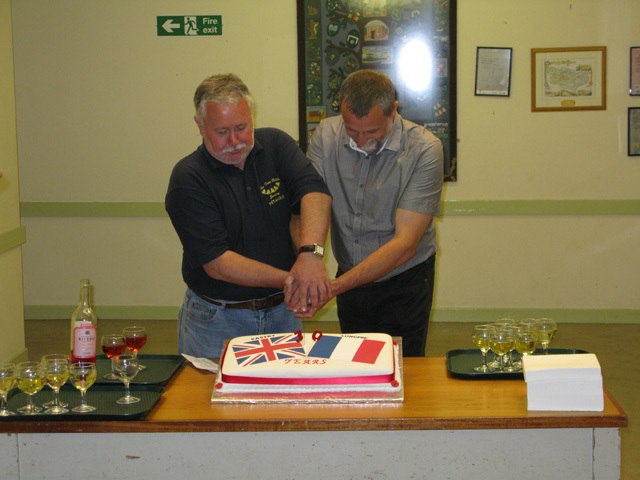 Alain was awarded a special prize for his dancing stamina and then we unveiled a special celebration cake made and iced by Graham Lane's sister Beena (a big thank you here as well). 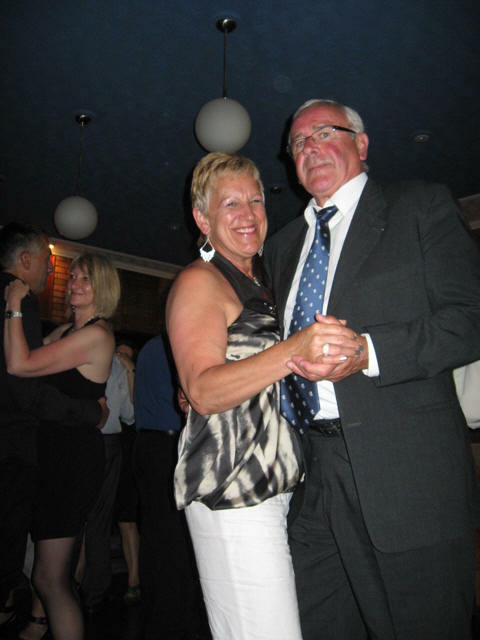 Slices of cake were handed out together with glasses of wine and then we all said our sad farewells - much cheek kissing, eye wiping and calls of année prochaine followed before everyone had to board the coach for the departure. 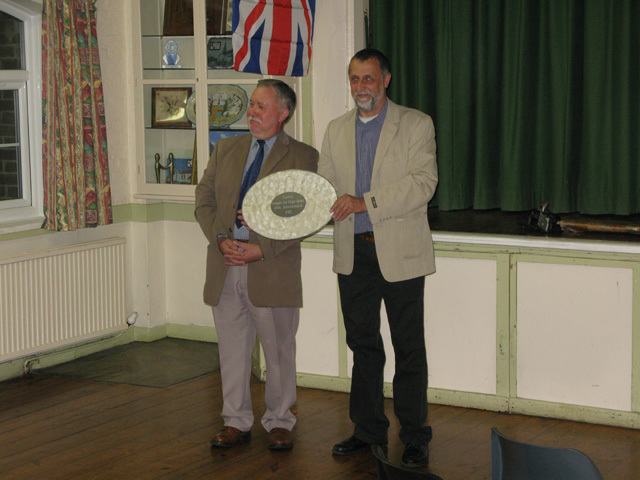 Another weekend in the life of the Eastry / Longpré twinning association. 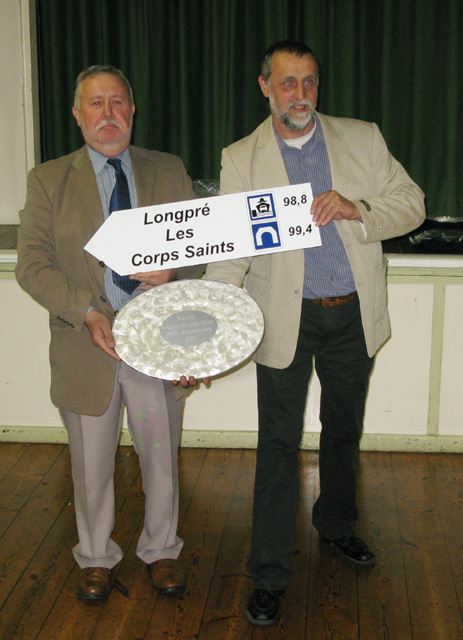 The date for our visit to Longpré in 2012 has been set for the weekend of June 2nd - keep the weekend free in your diary! 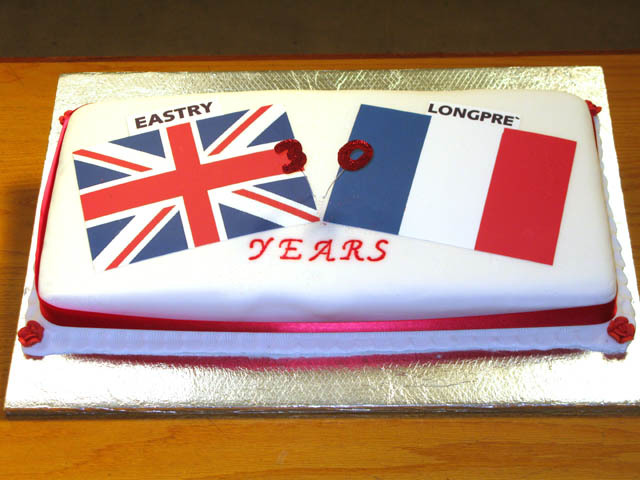 Eastry célèbre le trentième anniversaire de la signature de la déclaration de jumelage. Enfin! Le weekend était arrivé. Nos amis de Longpré nous rendaient visite. Après en avoir décidé la date l`an dernier, on avait passé le temps depuis lors à essayer d`organiser un programme approprié à nos hôtes, afin de faire honneur au trentième anniversaire de la signature originale de la déclaration de jumelage. On avait dressé tout un programme d`activités. On s`était procuré les fonds de roulement. Maintenant on allait tout mettre à l`épreuve. On allait voir si ces efforts porteraient fruit, c`est-à-dire si le weekend se passerait doucement et avec succès. vendred, le 20 mai 2011 on a vu arriver 41 invités de Longpré accompagnés de leur chauffeur qui les avait amenés jusqu`ici – on n`en avait pas tant vu depius longtemps, ce qui portait témoignage des efforts des comités des deux côtés pour encourager de nouveaux membres. 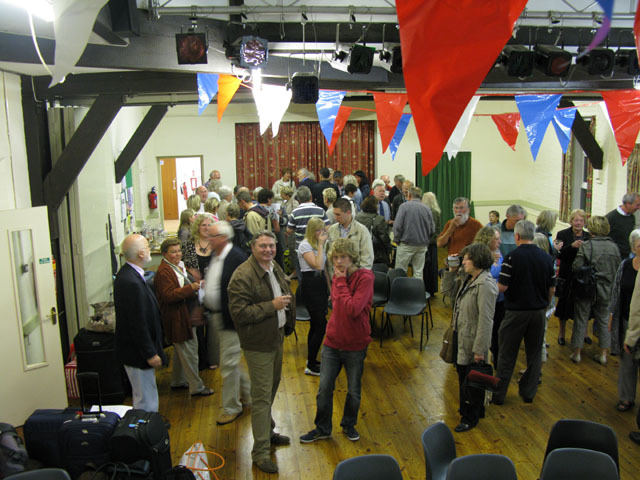 La réception a eu lieu dans le Village Hall d`Eastry òu les présidents ont fait un échange de cadeaux. 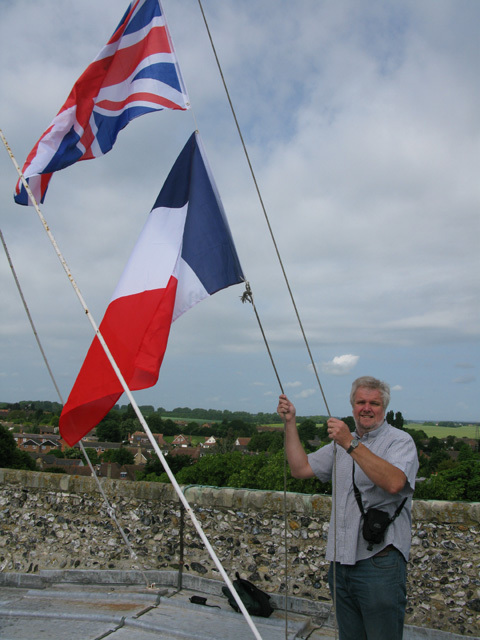 De la part de l`amicale d`Eastry, Terry James a présenté un plateau de nacre (le nacre est la pierre précieuse qui symbolise les annivesaires de trente années). En échange, il a reςu de Jean-Marc Vermoeren un paquet très bien enveloppé qui, après son déballage, a révélé un ècriteau qu`on avait fait faire exprès pour indiquer la distance d`Eastry à Longpré (à vrai dire, il indique deux routes: le voyage par le tunnel et le voyage en paquebot!). Juste aprés minuit les hôtes britanniques ont ramené les voyageurs fatigués dormir chez eux, et y trouver le repos dont ils avaient besoin, car samedi matin on allait commencer de bonne heure. samedi, le 21 mai il faisait très beau: un ciel bleu clair et du soleil chaud. Le temps était la seule chose sur laquelle nous n`exercions aucune influence mais il faisait un temps parfait pour les évènements qu`on avait préparés. À 09:15 tout le monde s`est réuni dans l`église pour un office de déclaration renouvelleé, qui allait refléter celui qui s`y était passé il y avait 30 ans. Nous avions la chance d`accueillir parni nous des gens qui avaient assisté à la cérémonie originale et, avec eux, des dignitaires de notre région et d`autres invités honorés. Malheureusement, à cause de son retour inattendu en France au dernier moment, M. Édouard Braine n`a pas pu assister à la cérémonie mais il a consenti à signer le certificat plus tard. 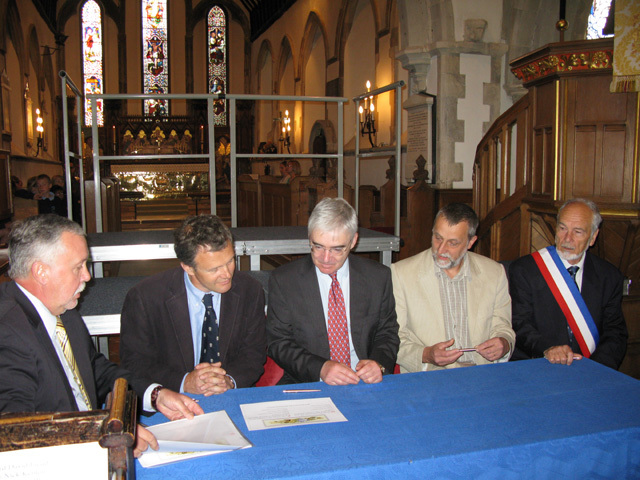 Cinq autres étaient présents pour signer ou bien attester le certificate: Terry James, Président de l`Association de Jumelage d`Eastry; Nick Kenton, Président du Conseil paroissial d`Eastry; et, comme témoin, Lord David Freud, Baron d`Eastry – de la part de l`Association franϛaise il y avait Jean-Marc Vermoeren, Président de l`Amicale de Longpré-les-corps-saints; et René Cailleux, Maire de Longpré. La cérémonie, dont la signature de la déclaration faisait part, comprenait aussi un petit film de la cérémonie originale qu`on a pris il y a 30 ans. On en avait déniché une copie dans les archives du musée à Douvres. 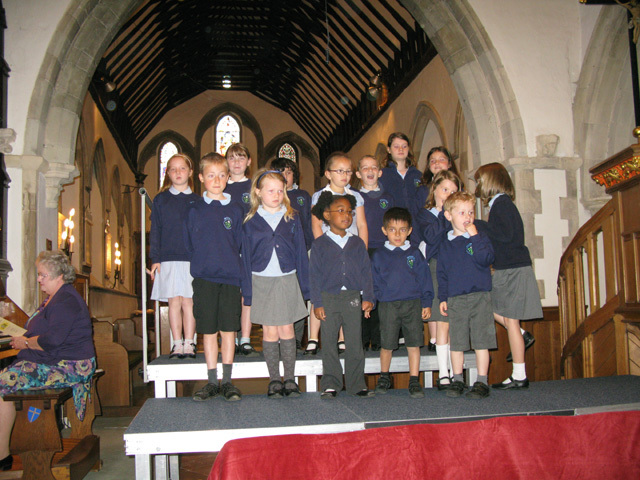 Les enfants de choeur de l`école primaire d`Eastry ont chanté la première strophe et de l`hymne national britannique et de la Marseillaise; ils ont été accompagnés au piano par le centenaire toujours enjoué, Martin Holloway. Maureen Norman, organiste à l`eglise Ste.-Marie, a joué de différents morceaux qui ont renfoncé l`atmosphère congéniale, et, d`ailleurs, nous remercions profondément la Révérende Jennifer Pilcher d`avoir dirigé l`office et de nous avoir permis d`ériger un échafaudage spécial. 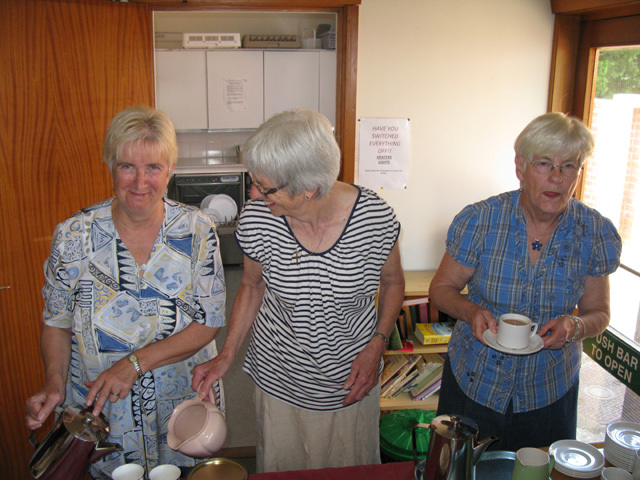 En quittant l`église, on a suivi le chemin vers le Church Hall òu une équipe énergétique de dames - Liz, Rosemary et Terri – a préparé pour tout le monde du thé, du café et des gâteaux délicieux faits à la maison (ensuite elles ont lavé toute la vaisselle). Encore une fois, mille remerciements. Ensuite l`ondre du jour indiquait qu`on pouvait jouer aux boules au boulingrin. Qu`y a-t-il de plus britannique que de goûter de thé, manger des gâteaux et alors jouer doucement aux boules? Le boulingrin lui-même était en très bon état et plusieurs visiteurs, y compris ceux qui avaient déjà été ici, n`avaient aucune idée qu`il existait. Ça a été une surprise. 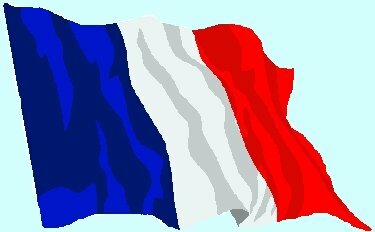 Les Franςais ont pris goût au jeu très rapidement (peut-être un peu trop rapidement, me disais-je!) et ils se sont très bien amusés. 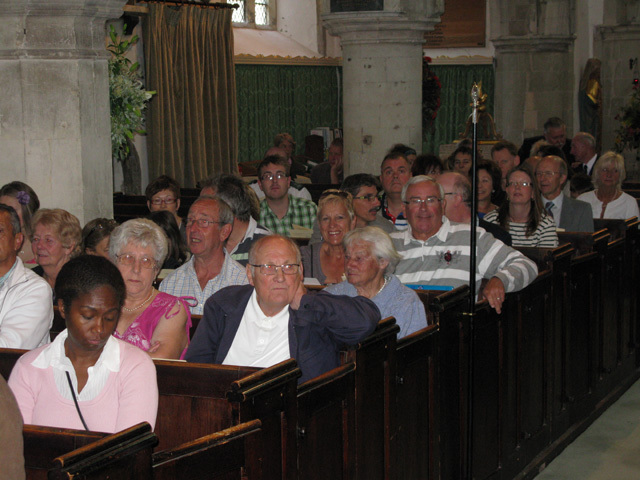 Même ceux qui étaient contents d`être spectateurs ont pris plaisir à rester assis au soleil en absorbant l`atmosphère bienfaisante Pendant que ceci se passait, dans le Church Hall des membres de l`amicale d`Eastry s`affairaient à préparer des “ploughman’s lunches” (lunch du laboureur) pour à peu près 80 gens – ou plus, sous la surveillance de Christine, notre propre “chef de cuisine” bien compétent. Après le lunch, les étalages de nourriture en plain vent s`étaient déployés et les luttes de traction à la corde commençaient à la pelouse communale. On avait aménagé cette fête avec prévenance afin de la faire coȉncider avec la visite de Longpré. Elle offrait alors encore un aperςu de la vie d`Eastry. Les Franςais ont formé deux équips qui se sont engagées pour la lutte. Comme au jeu de boules, ils se sont bien acquités et une des équipes franςaises a fini bon second. Après tous ces efforts, il était bien agréable de se relaxer, regarder les danses folkloriques, et écouter la musique, avant de rentrer pour se mettre en toilette du soir. Grâce à l`offre d`utiliser l`autocar qui avait apporté les visiteurs franςais, nous avons réussi à y installer tous ceux qui avaient besoin de transport et nous sommes tous partis vers le club de golf Prince’s, notre rendez-vous pour le dîner et la soirée dansante. Tout le monde a joui du cadre magnifique au coucher du soleil, d`un verre de Pimm’s au balcon et d`un excellent dîner à trois plats (three-course dinner). Ensuite ceux qui avaient assez d`énergie (presque tout le monde, à ce que je me rappelle) ont dansé jusqu`à minuit ou presque. Alain Defebvin, qui semblait ne pas manquer une seule danse, s`est particulièrement distingué. Les musîcîens ont été excellents, le repas a été excellent, le cadre également. La journée entière avait marché selon les prévisions et nous nous sentions très contents de savoir que nos hôtes s`amusaient bien. Ceux qui avaient pris l`autocar se sont encore régalés des chansons offertes par Graham et ensuite par Thierry, et malgré le fait que Graham confondait parfois la droite avec la gauche, notre conducteur, Pascal, nous a ramenés au village sains et saufs. dimanche, le 22 mai. Pour plusieurs d`entre nous, c`était une journée libre pendant laquelle les hôtes britanniques organisaient de différentes activités pour faire plaisir aux visiteurs. 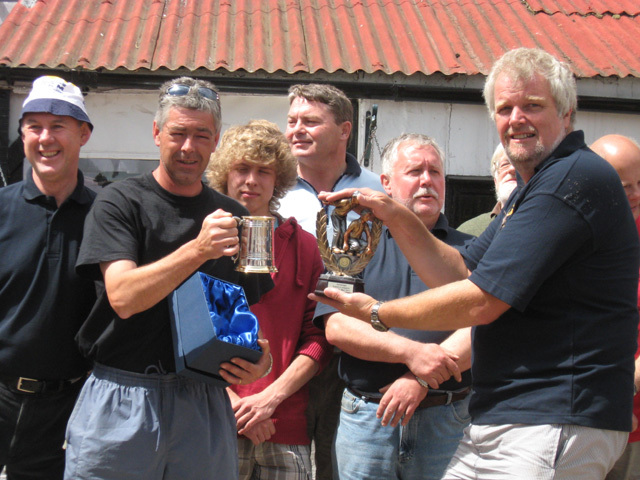 Pour d`autres, c`était le défi annuel de match de pétanque et du prix convoité, Les Cendres, que les Anglaîs ne gagnaient plus jaimais depuis 2003. Pas mal de spectateurs se sont réunis pour suivre l`épreuve sportive. Elle allait être une des meilleures et des plus vivement contestées que j`aie jamais vue. Un match de pétanque consiste en deux jeux “triples” suivis de trois jeux “doubles”. Les “triples” ayant fini à égalité, au début des “doubles” les équipes devaient risquer le tout pour le tout. Pendant quelque temps les points indiquaient qu`Eastry allait gagner les jeux tous les trois, mais la situation a bientôt changé et les deux équipes devaient jouer serré sans répit. À l`aide du “bombing” impitoyable et précis au suprême degré de Thierry Ducoin, Thierry et Jacques Daussy ont gagné le jeu contre Trevor Foster et moi-même. (La technique du “bombing” c`est de jeter sa boule à une distance de plus de 6 mètres avec une action dure et merveilleusement précise de sonte qu`elle déplace celle de l`opposition). Cependant, à la piste centrale, Robert Green et Dennis Sivil ont repris des forces et ont battu Patrice Alderweireld et Alain Defebvin – ce qui mettait le match à égalité encore une fois. Tout le monde fixait des yeux Graham Lane et Terry James qui avaient été de force à lutter contre Arnaud et Maxime Devauchelle. À ce moment Terry et Graham étaient les premiers et ne manquaient que de deux points pour gagner. La boule de Terry était le plus prés du cochonet et il ne restait que Graham à jouer. Son premier coup n`a pas réussi à s`arrêter plus près du cochonet que celle de l`opposition; mais à son deuxième coup il a changé de tactique et a réussi un coup à la Thierry, ce qui a knock-outé la boule de l`opposition et a fini par pendre sa place. Ce coup s`appelle un “carreau” et il a donc fait de sorte qu`ils avaient les deux boules les plus près du cochonet, ce qui leur a donné deux points et ainsi les a fait gagner le match: pour le première fois pendant 8 ans, les britanniques ont gagné 3:2. Les Cendres se retrouvaient en Angleterre pour une année au moins! Les capitaines ont fait un échange de cadeaux et on a rapporté les Cendres au “château ancestral”, dans notre nouveau placard d`étalage qu`on a fermé à clé. Les joueurs et leurs familles adoptives se sont retirés dans l`ancient poste d`incendie pour y savourer le lunch anglais traditionnel, le cari all riz, et pour badiner au sujet du match – comment l`a-t-on perdu, comment l`a-t-on gagné? Le dernier évènement du séjour a été la réunion de tous au Village Hall pour les adieux acompagnés de deux dernières surprises. Après avoir adjugé un prix spécial à Alain à cause de sa vigueur à la danse, on a dévoilé un gâteau d`anniversaire spécial que Beena, la soeur de Graham Lane, avait fait cuire et glacer (enore une personne que nous remercions du fond du coeur). On a servi des tranches de gâteau accompagneés des vernes de vin et puis tout le monde s`est dit au revoir un peu tristement – longuement, on se baisait à la joue, on s`essuyait les yeux et l`on se disait à l`année prochaine, avant que tout le monde ait dû reprendere l`autocar pour le départ. 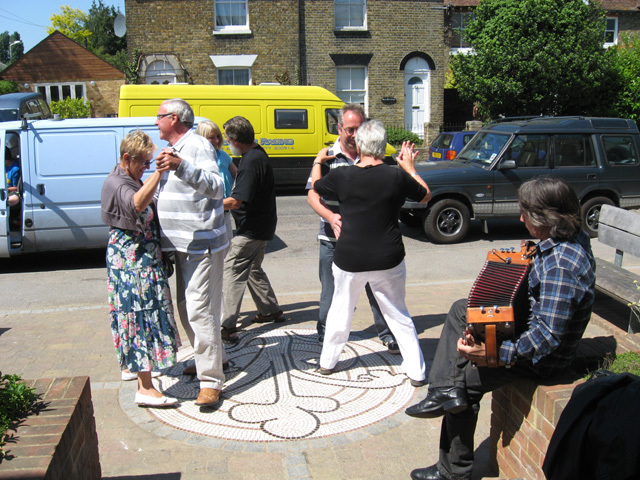 Encore un weekend dans la vie des amicales Eastry/Longpré. On a décidé la date de notre visite à Longpré en 2012, le weekend du 2 juin. Trois jours à garder libres qu`il faut écrire dans son agenda. 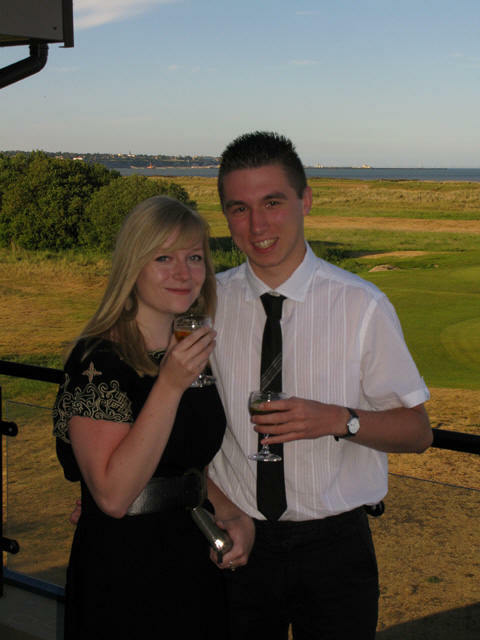 The tea and cake providers! Pascal finishing his cake before he'll leave!